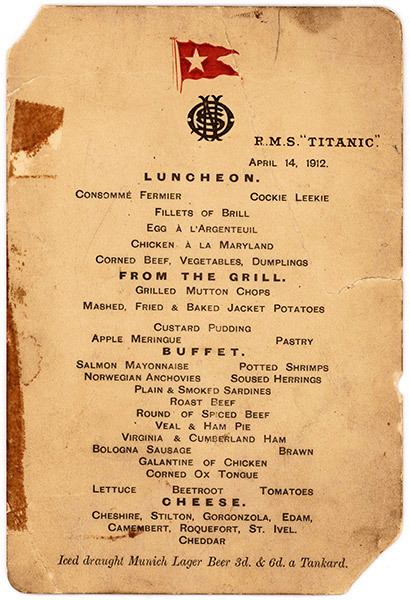 NEW YORK -- The Titanic's last lunch menu - saved by a passenger who climbed aboard the so-called "Money Boat" before the ocean liner went down - is going to auction, where it's estimated it will bring $50,000 to $70,000. The online New York auctioneer Lion Heart Autographs is offering the menu and two other previously unknown artifacts from Lifeboat 1 on Sept. 30. The auction marks the 30th anniversary of the wreckage's discovery at the bottom of the Atlantic Ocean. Abraham Lincoln Salomon was one of a handful of first-class passengers who boarded the lifeboat - dubbed the "Money Boat" or "Millionaire's Boat" by the press because of unfounded rumors one of them bribed seven crew members to quickly row the boat away from the sinking ship rather than rescue others. 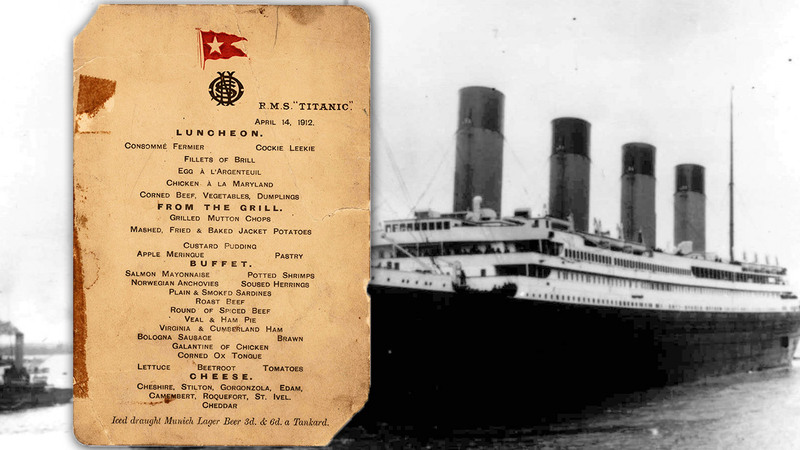 The menu, which listed corned beef, dumplings and other savory items, is signed on the back in pencil by another first-class passenger, Isaac Gerald Frauenthal, who escaped on another lifeboat. It's believed the two men lunched together that fateful day in 1912. Salomon also took away a printed ticket from the Titanic's opulent Turkish baths, which recorded a person's weight when seated in a specially designed upholstered lounge chair. It bears the names of three of the five other first-class passengers with him on Lifeboat 1. One of four weighing-chair tickets known to exist, it's estimated it will bring $7,500 to $10,000. The third artifact is a letter written by Mabel Francatelli to Salomon on New York's Plaza Hotel stationery six months after the disaster. She had climbed into the No. 1 lifeboat with her employer, aristocratic fashion designer Lucy Duff-Gordon and her Scottish husband Lord Cosmo Duff-Gordon, who it was alleged bribed the crew to row them to safety in the boat that had a capacity of 40. The Duff-Gordons, who were the only passengers to testify about the disaster, were cleared by the British Wreck Commissioner's inquiry, which determined that they did not deter the crew from attempting to rescue other people but that others might have been saved if the boat had turned around. A letter by Lady Duff-Gordon grumbling about the "disgraceful" treatment they received from the press and public upon their return to England sold at an auction in Boston earlier this year for nearly $12,000. "We do hope you have now quite recovered from the terrible experience," Francatelli wrote to Salomon. "I am afraid our nerves are still bad, as we had such trouble & anxiety added to our already awful experience by the very unjust inquiry when we arrived in London." It's estimated it will sell for $4,000 to $6,000. Lion Heart Autographs says the seller is the son of a man who was given the items by a direct descendent of one of the survivors of Lifeboat 1.